Lemon Meringue Pie is a summer dessert with WOW factor! If you want to impress your family and friends then this is a great one to make and it really is quite easy, let me show you how to do it. The first time you make it give yourself plenty of time, it is one of those desserts that does need time to cool once it has come out of the oven. So here we go . . This is where I admit to cheating (only slightly) by telling I buy ready made pastry, there is absolutely nothing wrong with that, sometimes we want to make something really nice but just dont always have eneough time! I will give you in a later post the pastry recipe that I have. Grease your flan dish and then take your ready prepared pastry and roll it out to fit your flan dish, make sure that you push it gently down to ensure the perfect fit. It should fit up and over the sides, trim off any excess. 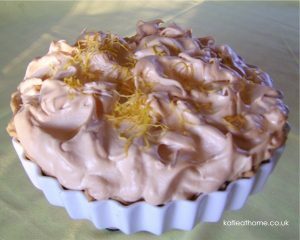 Put into a preheated oven of 180 deg C, 350 deg F, Gas Mark 4, bake for 10 – 15 minutes until your meringue has turned golden. 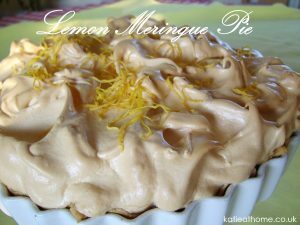 The consistency of the meringue in this pie is crisp on the outside, soft on the inside. 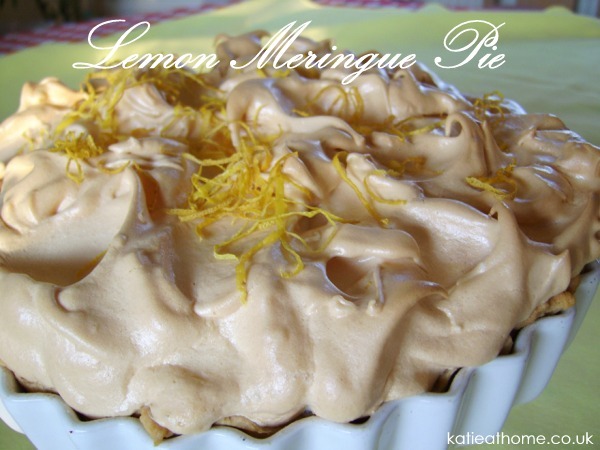 Once cooked allow to cool for 2 – 3 hours this allows the lemon filling time to set. Serve with scoops of soflty whipped cream and enjoy!